It can be so hard to transition into an office job, especially if you haven’t worked one before. But even if you have, there are some skills you can add to your resume to make yourself more marketable. The most common bookkeeping software is QuickBooks Pro. QuickBooks manages expense tracking, the recording of daily transactions, bill and salary payments, automated invoicing of recurring accounts, and data syncing. QuickBooks is also highly customizable, making it a favorite of many entrepreneurs. It customizes based on industry, invoicing, download preferences, and more. You can make lists, record business activity, and even download 3rd party software if there’s a function you’re missing. Bookkeeping is a very specialized skill, and being proficient at it makes you much more marketable. If you’d like to learn more about QuickBooks, you can read our blog post about it here or take our class this fall. MS Office is perhaps the most common software of all time. This suite includes Word, Excel, PowerPoint, and sometimes Outlook and Access. Many employers don’t want you to have a mastery of MS Office on your resume because it is so common—they just expect it from everyone. It is incredibly important to be able to use the suite properly and efficiently. There are many great tutorials out there to help you, or you can take our classes in the Office programs this fall. Resolving conflict and dealing with difficult people is one of the most important skills to be utilized in an office job (or any job!). How many people don’t like their boss? It certainly seems to be a running joke that coworkers are hard to deal with. In fact, dealing with difficult people triggers your fight-or-flight response. Some strategies are listening to understand, making a plan, and being proactive. You can read our blog post about it here. We offer the classes Dealing With Difficult People and The Art of Resolving Conflict. Time management is another important skill. It is important for just about everyone, and yet so many people have trouble with it. In the end, it’s all about planning: planning your day, planning your interruptions, planning your interactions, etc. Challenge yourself to get more done in the time you’ve allotted yourself. You can read more about our favorite time management and planning strategies here. You can also take our class in time management. These are just a couple of office skills. There are hosts of others. But getting better at your job doesn’t have to be hard. We offer many classes that can help you feel and work better. Find our QuickBooks class here, our Office Suite classes here, Dealing With Difficult People and The Art of Resolving Conflict here, and our Time Management class here. 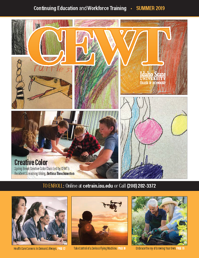 You can view our full course catalog at http://cetrain.isu.edu/enrollment/. Get smarter with us this fall.